Theron’s grandparents met us at the fairgrounds and he spent the weekend with them. 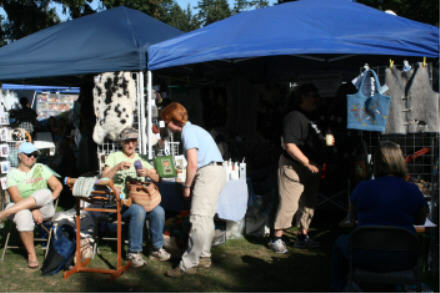 That left me to enter my fiber arts pieces, get my sheep settled, set-up the vendor space, let my dogs out, and get the tent set-up – thank goodness for friends! Robin and her friends, Kris and Diane, drove up from California and arrived shortly after we did. Robin and I camped at the fairgrounds and the weather was perfect. Jacobs showed first thing Saturday morning. There were 4 Jacob breeders with a very nice entry. Thanks to my friend, Kristine, I have some pictures to share! 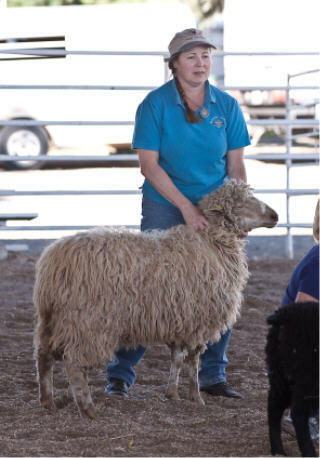 Here I am with Flirt, she won Reserve Champion ewe and Best Fleeced Jacob. 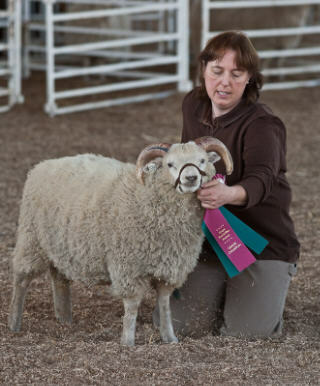 Kenleigh’s Torrent, owned by Brenda and Alan Searle was Champion Ram. 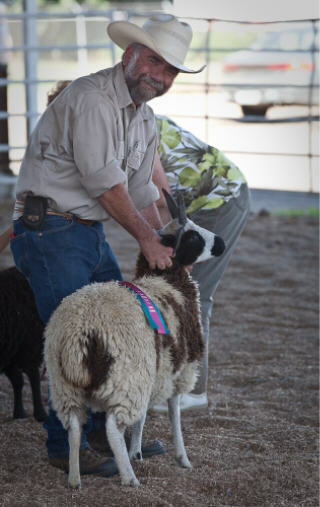 Jeff Jaqua with his ewe lamb that won Champion Ewe and then went on to win Champion ewe of the Classic division. The event was very well attended, especially Saturday. When Kristine arrived mid-day, she couldn’t find a parking spot and had to park at the Rite-Aid across the street. I shared a vendor booth with Robin and it was a bit interesting getting everything to fit! Here she is demonstrating a rigid heddle loom. There were 150 vendors at this year’s event and it was a bit overwhelming! So many colors and textures. I was on a mission to find a good red/brown color for felting dogs. I found two that I think will work well. 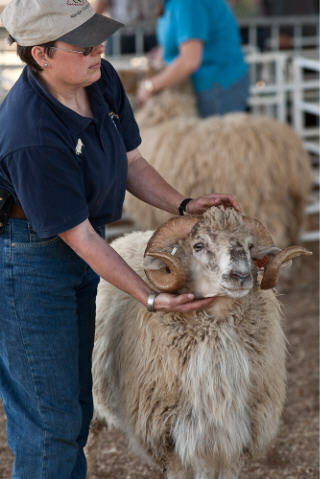 I had prearranged to meet Michelle and trade some of Wrangler’s fiber for some of Braveheart’s. I can’t wait to spin it up! 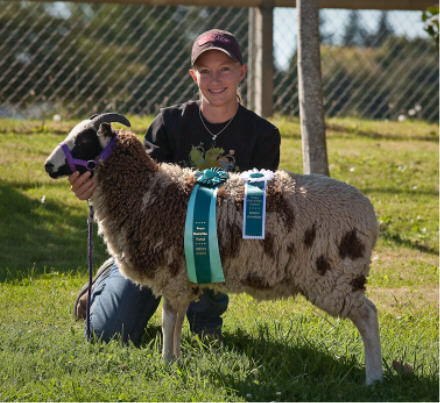 The Jacob shirt is from Brenda and Alan for helping them get their sheep to the show ring and showing Torrent. They (along with many other people) thought the Classic sheep show was on Sunday, not Saturday. Kate’s favorite part of the weekend was the daily duck herding demo that she participated in. She was the highlight for many people because she belly crawls when she works ducks – very funny! I love this picture – Kristine took it at another event we were at, but I got this look a lot this weekend. Notice the head is pointed in my direction, but the eyes aren’t. 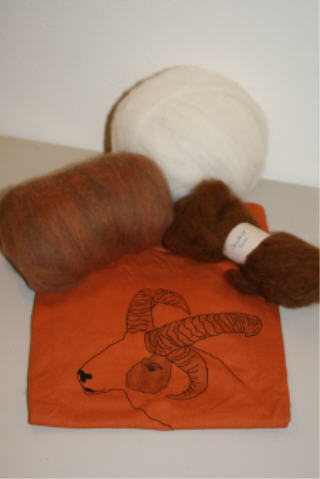 The felted bags were very popular and this was the first one to leave. We came home with one less sheep and a lot of good memories. GREAT report; thanks! 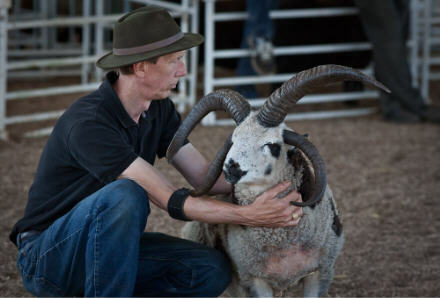 I’m glad to hear I wasn’t the only one caught by surprise by the sheep show days. 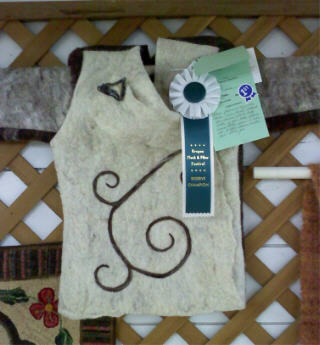 Congrats on your sheep and felting wins; well deserved! 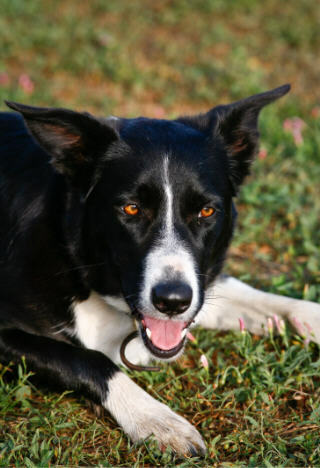 I’m looking forward to spinning Wrangler, too, but someone took my fiber life and now I can’t find it…. Congrats on your wins for you and Flirt. That ewe lamb of Jeffs is sure a pretty girl. Nice to see that Robin could head down for the event. OFFF this year was at the very same weekend of the Western Washington Fair so I elected to stay here and head to the fair. There were no Shetlands or Churros that I remember, must have all been in Canby. Nice looking Jacobs and it sounds like a great time. 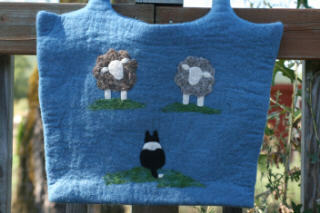 Oregon is so close and one of these years i will make it down to the Oregon Flock and Fiber Festival. Congratulations on your winnings! Wow, Congratulations Shannon! You sure had some excellent wins, even by your stock such as Torrent. How cool! I can see all your hard work and planning is starting to reward you well. PS: Looks like you’ve been right about Flirt all along. 😉 And great photos!